The HSM Securio B22s Strip Cut shredder is the ideal deskside shredder for offices, homes, and businesses that need a quiet and reliable shredder. The HSM Securio B22s shredder fits nicely beside your desk, easily shreds up to 18 sheets of paper at once into level 2 secure strips, and allows your office to remain productive while still being a quiet operation shredder. Check out the HSM Securio B22s level 2 office shredder from MyBinding.com today and save. Zero Energy Stand-By: Consumes no Power While the Machine is in Stand-by Mode. B22, B24, B32, B34. HSM – Great Products, Great People. www.hsm.eu. 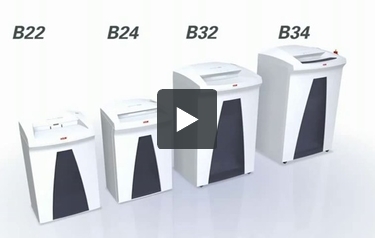 One thing that makes the Securio B22s stand out is its shredding capacity. This is a device that can shred up to 16 sheets of paper at a time. It can even destroy paper clips and staples so you can shred an entire multi-page document at once. The shredder's feed opening is 9.45" wide so you can work with letter-sized documents without any problems. You can also use this machine to get rid of legal-sized paper. This is a Level 2 strip-cut shredder so it's good for general shredding needs. Some of the things you can shred with it include e-mails, unwanted computer printouts, receipts, and envelopes. The Securio B22s has a waste bin that can hold almost 9 gallons of scraps. It's a pretty large waste bin so this would be a good machine to use in a shared work environment. If you want to control the noise level in your office, this is a great shredder to use. It operates quietly so people will still be able to concentrate when the machine is being used. However, the motor is still thermally protected so it won't overheat. HSM gave this device a pretty generous warranty. Labor is covered for 180 days while parts have a year's worth of protection. Since the Securio B22s is a strip-cut shredder with a Level 2 security level, it shouldn't be used to destroy classified documents. You should choose a different device if your business handles a lot of confidential information. This machine lacks the ability to shred multimedia items such as CD's and floppy disks. As we said up above, the HSM Securio B22s is a pretty basic device. This is mainly due to its lack of multimedia shredding capabilities but it's also because it has a Level 2 security rating. Since it offers a fairly low amount of security, it's not recommended for businesses that deal with a lot of highly sensitive information. However, for general office use, it would be a great choice. It has a first-rate shredding capacity and it runs quietly so it won't disturb the people in your office. Also, the waste bin is large so it won't need to be emptied very often. Overall, this is a decent shredder, so check it out if it sounds like the machine for you.